So much for taking it easy, Alberto Contador even tried a late attack yesterday to pre-empt the sprinters. Today brings the Queen Stage and a vicious summit finish. A Contador-Froome duel awaits but as it’s so early neither are at the top of their form and we should see others push them. Stage 2 Wrap: a long stage, an early breakaway and it all came back in time for the final hill, curiously FDJ had been doing a lot of the work. A few skirmishes for the mountains points and then a sprint seemed likely. 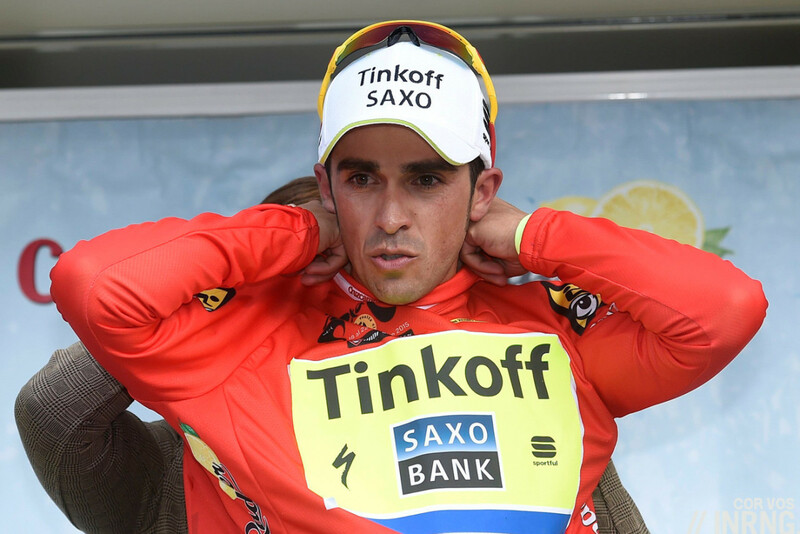 Suddenly the red jersey surged out of the bunch, a surprise move by Alberto Contador. He was reeled in but so much for taking it easy. In the sprint J-J Lobato made it look easy, surging ahead of the field and sitting up so early with his “telephone” victory salute he had time to dial an imaginary call centre and navigate enough options to finally speak to an advisor. Look at the profile and then look again, noting the y-axis. As you can see, there’s some serious altitude gain. The race starts with the Puerto de la Cabra, an ideal place for an early break to go away because if a move can stick to the next climb someone stands to wear the mountains jersey. Otherwise there’s a long wait between the two first category climbs, any climbers swarming off the front on the first climb will struggle for 100km before the final climb. 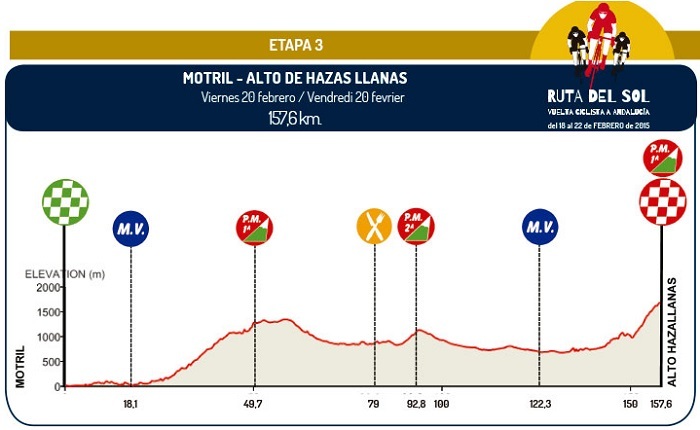 That’s the profile of the final climb, the Alto de Hazallanas. Listed as averaging 5% f0r 16km, that’s only because of the flat section and the descent and look at the double-digit gradients for the finish. 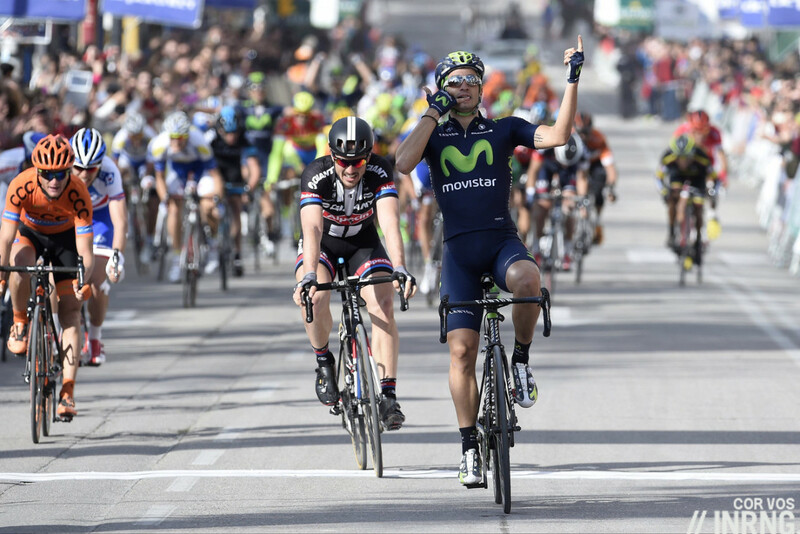 It was hard when it featured in the 2013 Vuelta but it’s wild for February. It’s a narrow and winding road but the slope softens just before the line. The Contenders: it’s difficult to bet against Alberto Contador. Was his sprint flourish yesterday a cannibal-like hunger to win everything or was it insecurity, an attempt to get something extra before he’s found out today? I think the former, especially as he’s already been on mountain training camps this season. He’s the top pick, especially because Tinkoff-Saxo have yet to win a race this year meaning victory matters more than just defending the race lead. Chris Froome is the other obvious pick. As his time trial shows, if he’s having a slow start to the season he’s still above others, he’s got Mikel Nieve for support. Movistar are having a great race and Beñat Intxausti seems their best pick, he’s not a big name but has collected consistent results. Dutch duo Wilco Kelderman and Bauke Mollema will be interesting to see. Mollema is ill and out. Kelderman seems more of the stage racer mould, a very capable time triallist and we’ll see how he copes with awkward variations in gradient, he’s got Steven Kruijswijk for help. French trio Romain Bardet, Pierre Rolland and Kenny Elissonde have the ability to shine but are infrequent winners. Bardet is the punchier rider for the sharp climb, Rolland tends to climb more by force and such slopes might be too much – he might prefer a long raid today – while Elissonde is a normally a support climber for FDJ, not for him months spent climbing Teide. Among the others Merhawi Kudus has the talent to win mountain stages but today might be too soon. Daniel Navarro of Cofidis is a solid climber and we’ll see Tim Wellens in action. For long range breakaway hopes, watch Nicolas Edet of Cofidis and the whole of Team Colombia. Weather: cloudy at times and a top temperature of 12°C with no wind forecast. TV: live on Eurosport with the finish forecast for around 3.40pm. Tune by 3.00pm to watch them approach the climb. For more viewing options, as ever cyclingfans.com and steephill.tv have links to live feeds. got to be Contador. His team looks light though. He’s got Ivan Basso to set tempo and Jesus Hernandez too, maybe Michael Valgren can cover as well. But the climb is so steep it’s really about individual W/kg, the benefits of having someone set the pace are probably more psychological than physiological. Following on from your previous post, if it is either Contador or Froome taking the win over the other, I wonder exactly how many picoseconds it will be before someone pens an “indicator of how the contenders are shaping up for July” piece? I’ve seen tweets on it already. I’m not looking past Contador for this one. In the Vuelta Foome had no answer and its a similar situation here in that Alberto only has to follow his wheel. Thats an advantage. As a reminder all corrections are welcome, it’s helpful. Never the less, Kudus did very well in the stage today (7th I think)! There has been a lot of hype about him in the past, maybe 2015 could be his year to shine. Once the table was set with Contador leading Froome, I don’t know that Froome tries to contend now in an effort to hold his cards. IF he has them. He certainly will in July but understandably may not now. Contador has willingly or unwillingly put himself in the position of showing his. He’s better than he’d advertised. And way early. It quickly demonstrates the mission he’s on this year. He may even have surprised himself. Contador might as well go ahead and win this. Froome can contest but might want to watch and critique Contador, pick up some tells, without any negative consequences being that it’s February. yeah good shout – although Contador is looking first to Giro, not July yet. I have been a fan of the technical director. He stuck with the overhead cam for the last 1500 meters. It really gave a better view of the gaps and where riders were positioned. Probably a good thing there was not a full on bunch sprint as they hit a speed bump about 50 meters past the line. Bertie doesn’t know the meaning of “taking it easy”.